William B. Williams was hired as a staff announcer at WAAT in Newark. According to Williams “the guy who did the all-night show had just been fired for being bombed on the air.” Six weeks later, a staffer at WNEW heard Williams on the air at WAAT and invited him to apply for a job at the station. He was hired at WNEW and worked several time slots before being fired by station manager Bernice Judis in 1947. An article in the New York Daily News suggested that Williams was fired for his aggressive tactics with management in his role as shop steward; however, WNEW’s official story was that he was fired after Judis caught him one evening in the studio with his feet propped on the desk clad in bright red socks. She was apparently horrified by his lack of style. Williams worked at several others stations, including WOR, but was rehired at WNEW in 1953 following a management change. 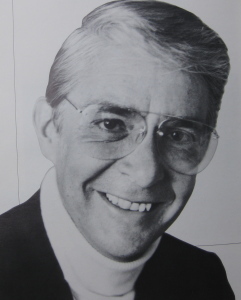 While at WNEW, Williams hosted The William B. Williams Show in the morning hours, and Music in a Sentimental Mood in the afternoon. Williams marked the broadcast as his own, using the distinctive sign-on, “Hello, world”, and occasionally identifying himself as “Guilliermo B. Guilliermos” or “Wolfgang B. Wolfgang,” although to listeners and friends he was known simply as “Willie B.” He combined intimate knowledge of music with his personal anecdotes to create a smooth style that captivated listeners. 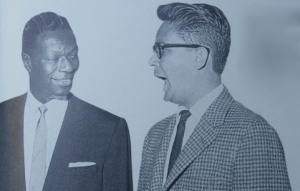 Williams developed lasting relationships with the top singers of the Great American Songbook, including Lena Horne and Nat King Cole. 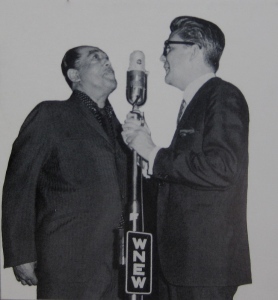 Early in his career, he befriended Frank Sinatra when the crooner recorded broadcasts at WNEW. On one broadcast, Williams mused that since Benny Goodman was the “King of Swing” and Duke Ellington was a duke, then Sinatra must have a title as well, suggesting “Chairman of the Board.” Sinatra learned of the comment and embraced the title. As Rock and Roll emerged as a dominant force and interest passed on The Great American Songbook, Williams persisted in playing Sinatra’s music and is credited with a key role in keeping Sinatra’s career afloat. Sinatra, to whom loyalty was a key virtue, never forgot Williams and lauded him to any and all who would listen. In the 1960’s, while WNEW was still playing pop standards, soft rock was a big part of the format, making them a MOR station. Williams disliked most of these songs but played them as required. In the 1970s WNEW became more of an adult contemporary radio station mixing in very few pop standards. William B Williams stated that during 1965 to 1978, WNEW was at its worst. Into the 1970’s the “Make Believe Ballroom” title was dropped from Williams’ show, although he continued to host in the late morning and early afternoon. Recognizing the errors of their ways in the fall of 1979, much to William’s happiness, WNEW began restoring the standards format leading off with a revived “Make Believe Ballroom”. In January 1981, WNEW dropped the adult contemporary format and adopted the standards format full-time. The chance of doing a world beating show every day is impossible. So people listen for long periods of time. Let’s say one day I don’t play the kind of music they want to hear or I don’t say the things they want to hear, they will still stay with you because they know having heard over the years, if I am lousy on Tuesday I’ll make it up to them on Thursday. They forgive you more. Williams was an officer and long-time member of the New York Friars’ Club. Willie B. was named Man of the Year by the club in 1984 in a ceremony hosted by Frank Sinatra. One year later, the Friars Club Foundation made him the recipient of its Applause Award in recognition of his charitable efforts.